One of the biggest electoral battles of 2016 will be fought in Assam. Tarun Gogoi is facing enormous anti-incumbency as he leads the Congress to the hustings even as a resurgent BJP is expected to mount a stiff challenge. In fact, Modi has already launched the party’s electoral campaign. The pitch is queered by the AIDUF led by Maulana Badruddin Ajmal which is expected to perform handsomely in the minority dominated areas and several regional parties that claim entrenched vote banks of their own. The Congress currently holds 78 of the 126 seats in the Assam legislature, with AIDUF placed at number 2, holding 18 seats. BJP with a mere 5 seats has long been considered a minor player in Assamese politics. However, the tables were turned during the 2014 Lok Sabha elections when BJP won 7 of the 14 Lok Sabha seats from Assam. The Congress and the AIDUF bagged 3 seats each. The BJP has since then, come out all guns blazing, having learnt from past mistakes and is leaving no stone unturned in ensuring that Assam becomes the gateway for BJP’s lotus to blossom in the North East. Only years ago, BJP was a minor player in Assamese politics, dominated by the Congress and the Assam Gana Parishad. However, over the years as the Assam Gana Parishad has withered away, the memories of its birth and the epoch making Assam Agitation have faded from the minds of people. This article will cover the tumultuous days of Assam agitation. In 1905, the British endeavored to partition the unwieldy province of Bengal that included parts of modern Indian states of Odisha, Assam, Bengal and the present day Bangladesh. The British created 2 entities, Bengal (composed of Bihar and West Bengal) and East Bengal and Assam. Following violent protests, the partition was undone and Assam was established as a full fledged province. For years, there had been an exodus of predominantly Muslim Bengalis from East Bengal into Assam. These immigrants found fertile land easily available in Assam and settled down. Eventually many more Bengalis would settle down in Assam. In a matter of 40 years, between 1901 and 1941, Assam’s population had doubled. With partition, the Muslim majority district of Sylhet was severed from Assam and made a part of East Pakistan. For now it seemed that the tide of Bengali immigrants would be stemmed. However the trickle continued. In 1971, the Pakistani army decided to crack down on Bangladeshi separatism. This, combined with lax security arrangements on the border, enabled millions of Bangladeshi citizens to enter Assam. In the 70 years between 1901 and 1971, Assam’s population increased from 3.29 million to 14.6 million – a 343.77 per cent increase over a period when the population of India had gone up by only about 150 per cent. In 1951, Assam counted around 20 lakh Muslims. By 1971, this number had gone up to 36 Lakhs. The 1991 census counted nearly 64 lakhs Muslims living in Assam. In 1979, Mr. Hiralal Patwari, MP from Mangaldai constituency passed away suddenly. The Election commission began the task of preparing voter lists. Allegations of illegal voters getting registered started to pour. Upon investigation, the election commission found that nearly 70% of the allegations were true. It also discovered that 45000 illegal foreigners were registered in the voter list. Assam had been simmering with the illegal foreigner issue for some time but these revelations set the stage for a state wide agitation. The All Assam Students Union (AASU) adopted the agenda of diriving out the foreigner and protecting the Assamese identity. AASU demanded that elections be put off, voter lists be verified and foreigners names deleted. In a matter of days, Assam had come to a grinding halt. Assamese supported the movement in large numbers,actively participating in the agitation. Bengalis, both Hindu and Muslim were targeted by mobs who endeavored to create an Assam for Assamese. The anti-foreigner, Assam agitation soon degenerated into reckless violence. Administrative machinery buckled as arsonists took over. In 1979, elections could be conducted for only 2 of the 14 Lok Sabha seats in Assam. In the meanwhile, Indira Gandhi returned at the helm in Delhi. She showed a marked disinclination to negotiate with the agitators. 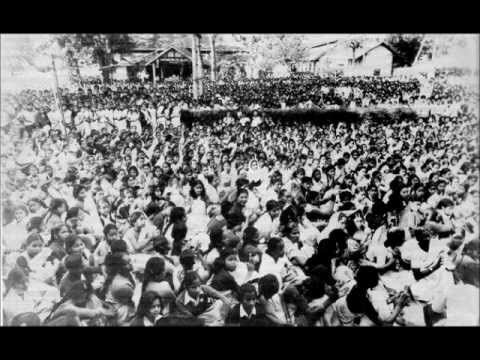 In 1983, even with Assam subsumed under a sea of violence, Indira Gandhi declared her intent to hold elections in the state. This meant that over 4 million illegal foreigners would have been eligible for voting in the elections. The decision converted Assam into a ticking time bomb. AASU created the All Assam Gana Sangharsh Parishad (AAGSP) to protest against the decision of the central government. The AAGSP gave a call for boycott of the elections. In one of the more violent incidents of Assam agitation, a massacre was unleashed at Nellie, where one ‘foreigner’ had won the elections. Eventually, the public support for the agitation began to dry up. It was around this time that Indira Gandhi was assassinated and Rajiv Gandhi took over reins of power. He began to work towards a solution for the Assam agitation. In 1985, the government of India concluded the Assam accord with AASU and AAGSP leaders, notably future Chief Minister, Prafulla Kumar Mahanta. The accord met some of the agitators’ demands. Notably, it was decided to set 1966 as the year for identification of ‘foreigners’. This implied that the ‘foreigners’ would be expelled eventually. The Central government showed marked indifference in meeting the terms of the accord. ‘Foreigners’ were seldom identified and rarely expelled. Voter lists were updated in name only. Border controls were not tightened and illegal Bangladeshi immigration continued unabated.Experts also claim that the language of the Accord made it impossible for it to be implemented. The leaders of Assam agitation formed a political party, the Assam Gana Parishad which swept the polls held in December 1985. Once in power, the leaders soon set aside the agenda which had brought them to power. This period saw the rise of United Liberation Front of Assam (ULFA), which resorted to terror and violence in its aim for an independent Assam. The emergence of vote banks and vested interests has further dealt a death blow to Assam agitation and its demands. As per 2011 census, 9 of the 27 districts in Assam are Muslim dominated (In 2001, this number was 6). More still have a substantial Muslim population. This has contributed to simmering tensions between Assamese, Tribals and Bengali Muslims. The 2012 Kokrajhar violence is attributed to shifting demographic plates. Ethnic Bodos are slowly but surely being edged out by Bengali Muslims. This has also had an impact on the political map of the state. In 2014, BJP won its 7 seats in Hindu majority North and Central Assam, while the AIDUF won its 3 seats in Muslim dominated districts. Unless there are ‘strategic alliances’ of the like seen in Bihar, chances are Lok Sabha results will repeat themselves. BJP is actively pursuing the Hindu Assamese to vote en bloc for it, while Maulana Badruddin Ajmal commands unflinching loyalty from Bengali Muslims. AGP today is a spent power and by the looks of it, Congress will also be set aside during the 2016 elections. However, the key questions of Assam Agitation still remain pertinent. Will Assam be eventually reduced to a Bangaldeshi colony as ethnic Assamese are increasingly being outnumbered by illegal immigrants. In the 1931 census report of Assam, C.S. Mullan, the Superintendent of Census Operations had said “Probably the most important event in the province during the last twenty-five years – an event, moreover, which seems likely to alter permanently the whole future of Assam and to destroy… the whole structure of Assamese culture and civilization – has been the invasion of a vast horde of land-hungry Bengali immigrants, mostly Muslims, from the districts of Eastern Bengal”. He had gone on to say that probably the day was not far off when the Assamese people would be confined to the district of Sibsagar. Similar comments made by Governor of Assam SK Sinha said that the eventual aim of illegal migration is to sever Assam from India and make it a part of Greater Bangladesh. It is shocking that our politicians are choosing to be the Ostrich at a time when the country and the state desperately needs their leadership. Averted Terror attacks – Terror Attacks that we don't Care about!